TV is a great opportunity for small business marketing, but not in the way you might be thinking. If you are expecting us to be suggesting that your small business should be spending your tight budget on TV advertising, you’d be wrong. Television advertising for small business is not often the best choice for where to spend your limited marketing budget, so let’s make that clear right up front. However, taking advantage of TV for your small business should be something considered crucial for your small business digital marketing efforts. Did you know that almost 85% of internet users surf the web while watching TV? It’s true! And this fact can be leveraged for your small business marketing in a couple of valuable ways. Between 52 and 68% of American smartphone and laptop users are dividing their time while watching TV. They are multitasking between their TV program and the internet on these connected devices. Add tablets into the mix and that equates to 182.9 million -or- about 80% of US internet users who multitask between the internet and watching TV at least once per month. It is extremely important to understand that the time that Americans spend watching TV is becoming increasingly distracted. At the same time many are cutting the cord to paid TV services such as cable at an accelerated rate. In fact, the number of people cutting the cord will grow 15.7%, which is a drop in pay TV viewers of 0.6% over last year. This results in the loss of 1.3 million pay TV viewers in the US. So not only are TV viewers distracted with the internet while watching TV, the writing on the wall is showing that paid TV services are increasingly going to become a lesser medium for internet users in coming years. But what is also important is that small business can take advantage of these distractions to gain affinity with these users online. Being connected to groups, people and companies that share similar interests is something that human beings are programmed to do. We tend to hang out with people like us and that affinity is often connected to interests that are similar. We relate to people like us and connect around those similar interests. Small business can do the same thing on a personal level with people who share a common interest. A specific TV show for example. So if we know that your small business has a specific target audience that watches a specific television show, it would behoove your marketing to incorporate TV show or shows into your digital marketing and social media marketing. This can be done a few different ways. If you are sure that your local small business prospect is watching a specific TV series, you are able to use that show for additional research about your target audience. TV advertisers are often provided a substantial amount of research data about shows that they are considering buying time on. This research data provided by the networks helps advertisers determine if the market segment that watches the program are in fact who they are trying to reach. Based on this information you as a small business owner should be paying attention to the TV ads played during the show to gain additional insight on what your target audience is interested in. More importantly it will give you a great idea about their personality and cultural queues that can guide you even further. If your customers are truly gaga over a specific TV show, do the research to understand the hashtags being used by users during the program. Use these hashtags to tweet commentary and other information about the show live, while the multitasking users are also using their connected devices. Now that you know the hashtags that are used around a specific TV show you are targeting, you can easily combine those hashtags with location information to find your target prospects also tweeting or posting about the show. Additionally, using this method you can also identify any influencers that are thought leaders on the topic/TV show and build relationships with them to help increase your small business exposure. There are many tools that can help you with this searching process, especially for Twitter. One that we have used a lot is called ManageFlitter. Finally, using what you have done and learned through your involvement around a specific TV show or shows, you should have a much better idea of the topics and TV show content that your target audience is really interested in. Your digital marketing and social media marketing should include creating and also sharing much more content around the topics that you’ve discovered your customers are interested in, as well as content surrounding the specific TV show. *Note – Most TV shows post their main hashtag on the bottom right of the TV screen. Watch for it and use it with your audience online. Consumers are clearly becoming much more digitally focused and small businesses should be using this to their advantage. When you know what TV shows your customers are interested in, you can easily find them through social media as they share content and activity around that show. By creating an affinity with them around that interest, they will be much more open to your small business and what you do. This opens the door to conversation and direct digital relationships with them that (when executed correctly) will result in traffic to your website, store and revenue. People buy from people who they know and like. 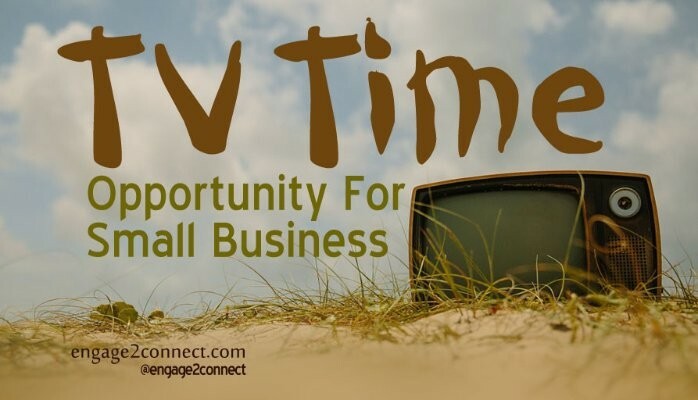 Use TV time as a way to connect with your small business customers and start conversations, so they can get to know your small business and like you.